Part Number: 56964P. We're your port for thousands of hard to find boat parts, original manufacturer's parts and marine surplus. Check out this deal! Connects with (2) single spade male and (1) pitot connector. Length: 12ft. 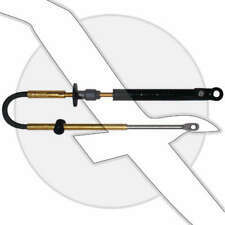 Johnson Evinrude Throttle/Shift Cable. Featured Products. Transom Drain Plugs. Light weight and strong! Perfect for the interior or exterior on boats and RV. Easy to install in minutes. Outboard or sterndrive hydraulic steering fill kit. 1/4" fitting to screw into fill fitting at helm. This fill hose is the old style. Has not been used. 2 ASSEMBLIES PER KIT AS SHOWN. 3" BULKHEAD FITTING, SINGLE CYLINDER. (1) #SH5094 Helm Assembly. (1) #SB27484 90 Degree Bezel Kit. We're your port for thousands of hard to find boat parts, original manufacturer's parts and marine surplus. Check out this deal! Installation instructions. Sold As Is. Mouse over pix to zoom in. SEE PICTURES. SeaStar 3" Bulkhead Fitting Kit, Single Cylinder HF5513. 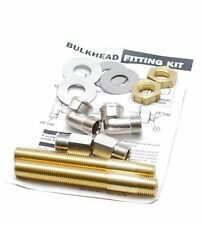 3" Bulkhead Fitting Kit, Single Cylinder. Sold 2 assemblies per kit. Part number SS13714. Quick 3.0 turns lock-to-lock, a compact rotary style helm, and a standard 3/4" tapered steering shaft. Fits boats up to 24' and steering wheels up to 16". This helm has been remanufactured by Boat Steering Solutions, LLC in North Venice, FL. We are a factory authorized warranty and service center. Seals, gaskets, O-rings, and other parts have been replaced as required. This is a brand new Teleflex/Seastar HO5010 twin engine tie bar for use with a splash mount hydraulic cylinder. Teleflex CC63516 Control Cable Mercury Mariner Outboard 16' Ft.
For SeaStar or Baystar steering systems. HO6001 Universal Tie Bar Features. HO6001 is used for engine centers up to 36". Essenbay Marine. 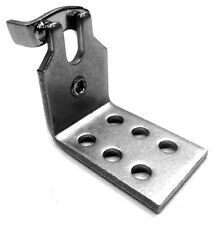 Fits Safe-T Quick Connect and Threaded steering systems. SSC62 series DOES NOT include an adapter. If you have NUTS at EACH end you will NEED the adaptor(SA27620P Converter). Order that length of cable. For SeaStar or Baystar steering systems. Two 10' hoses with factory installed fittings. Heavy duty marine wiring harness, color-codes to match existing trim and jackplate wiring. With Pro Trim from SeaStar Solutions, you can keep both hands on the wheel and concentrate on your driving. Pro Trim Lever. Heavy duty marine wiring harness, color coded to match existing trim and jackplate wiring. 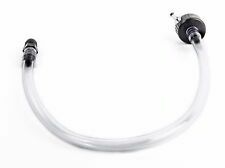 Filler hose with fittings HA5438. Hydraulic steering fluid HA5430. Wheel Viper, (14"") Ergonomic Grip. Sale is for a pair of 13' CC63513 cables. Part Number: CC20514. Fits all OMC, Johnson, Evinrude 1979 and newer motors. We're your port for thousands of hard to find boat parts, original manufacturer's parts and marine surplus. Check out this deal! (1) #300616 Tall Inboard Bracket. Part Number: 300616. We're your port for thousands of hard to find boat parts, original manufacturer's parts and marine surplus. Check out this deal! Constructed of solid brass and aluminum, this steering kit includes the following. SeaStar Front Mount Cylinder Seal Kit. We are only human, while unintentional, mistakes can occur. Length/Size: 15ft. • Kits include: cable, helm, bezel, hardware and instructions. SH-5094P Safe-T Quick Connect Single Helm. SeaStar Rotary Steering Kit. SSC6215 Quick Connect Steering Cable. Ideal for traditional boat applications, Safe-T QC suits inboards, small outboard and power assisted stern drive applications. Vendor #: D800575. Part #: HO5090. We're your port for thousands of hard to find boat parts, original manufacturer's parts and marine surplus. Check out this deal! It includes the black plastic cover and black plastic bezel/bushing. (JS / LOC: U3 D / 9036309) (44) / LH. Pictures are representative and may not be of this exact cable. Length: 24' (288"). In most situations you can buy a Square Trade warranty on the item for a small fee. Part Number: SH91800P. We're your port for thousands of hard to find boat parts, original manufacturer's parts and marine surplus. Check out this deal! This cylinder has been remanufactured by Boat Steering Solutions, LLC in North Venice, FL. We are a factory authorized warranty and service center. Seals, gaskets, O-rings, pistons and other parts have been replaced as required. 15ft 6" cable. We're your port for thousands of hard to find boat parts, original manufacturer's parts and marine surplus. Check out this deal! Hardware and instruction / installation manual not included. Length/Size: 8ft. • Kits include: cable, helm, bezel, hardware and instructions. SH-5094P Safe-T Quick Connect Single Helm. SeaStar Rotary Steering Kit. SSC6208 Quick Connect Steering Cable. Ideal for traditional boat applications, Safe-T QC suits inboards, small outboard and power assisted stern drive applications. All parts are accounted for, matching up to the parts list on the instructions. West Bend, Sea King, and possibly more. © Marine Parts Source. Star Brite 93016 StarTron Gasoline Additive 093016 16 oz. Sierra Rotor 18-5407. You might also like. Length/Size: 13ft. • Kits include: cable, helm, bezel, hardware and instructions. SH-5094P Safe-T Quick Connect Single Helm. SeaStar Rotary Steering Kit. SSC6213 Quick Connect Steering Cable. Ideal for traditional boat applications, Safe-T QC suits inboards, small outboard and power assisted stern drive applications. EXTENSION MF, NLA MICRO CABLE. RUSTY RON'S MARINE SURPLUS. Hardware and instruction / installation manual not included. Item sold as seen in picture. Control, SM, Chrome Hdl, Blk Cover, Ch Blk Inserts, I/O O/B SS. The cylinder utilizes the factory outboard engine supplied drag link for simplified installation. Baystar Hydraulic Outboard Steering system. Baystar compact system designed to fit even the narrowest splashwells. Sale is for a pair of 24' CC63524 cables. Size: 15ft. Complete with and all the necessary seals and o-rings, impeller and all new and improved wear plate with integrated rubber gasket. ALPHA ONE GEN II REPAIR KIT. Complete water pump impeller repair kit. Replaces OEM 21951346 and 3862281. Genuine, factory matched spray paint for Volvo Penta sterndrives and transom assemblies. SeaStar Classic Tilt Helm 2.4 - HH6542.